Learn more about what makes Ensure Enlive so advanced. Water, Corn Syrup, Sugar, Milk Protein Concentrate, Sodium Caseinate, Canola Oil, Cocoa Powder (Processed with Alkali), Corn Oil, Soy Protein Isolate, Short-chain Fructooligosaccharides, Calcium Beta-Hydroxy-Beta-Methylbutyrate. Less than 0.5% of: Whey Protein Concentrate, Potassium Citrate, Natural & Artificial Flavor, Potassium Phosphate, Calcium Carbonate, Sodium Phosphate, Magnesium Hydroxide, Ascorbic Acid, Choline Chloride, Distilled Monoglycerides, Soy Lecithin, Cellulose Gel, L-Carnitine, Carrageenan, dl-Alpha-Tocopheryl Acetate, Zinc Sulfate, Cellulose Gum, Ferric Phosphate, Niacinamide, Calcium Pantothenate, Manganese Sulfate, Cupric Sulfate, Pyridoxine Hydrochloride, Thiamine Chloride Hydrochloride, Riboflavin, Vitamin A Palmitate, Folic Acid, Chromium Chloride, Sodium Selenate, Biotin, Potassium Iodide, Sodium Molybdate, Phylloquinone, Cyanocobalamin, and Vitamin D3. 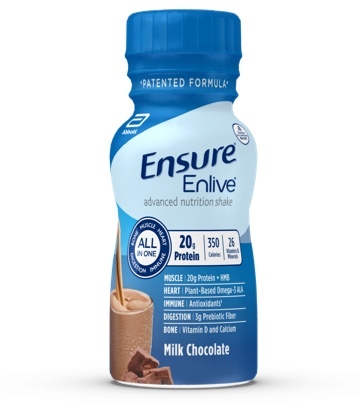 How is Ensure Enlive different than other Ensure products? †Study was conducted in over 600 malnourished adults 65 years or older. Reference: 1. Deutz NE, et al. Clin Nutr. 2016;35:18-26. What is the unique ingredient, HMB, in Ensure Enlive? HMB (beta-hydroxy-beta-methylbutyrate) comes from a building block of protein and is found in small amounts in some foods. It is difficult to get enough HMB from your diet. HMB supports muscle health.. Ensure Enlive is rated 4.8 out of 5 by 585. Rated 5 out of 5 by clockee from Muscle loss due to liver failure I am currently in liver failure and while I was in the hospital last year my doctor put me on Ensure Enlive because I have lost such huge amounts of muscle mass, my general nutrition & health was pitiful from being so sick all the time. The hospital got my liver stable and I firmly believe that drinking the Ensure has helped me recover my muscle mass. I don’t plan on giving it up even after transplant and the chocolate taste really good and it’s good for me I can see the benefits for it well past my transplant. Rated 5 out of 5 by Crazygma70 from Ensure Enlive works wonders! My 49year old step-daughter is a cancer patient & Ensure Enlive,recommended by her Dr. has helped her gain weight & combined with physical therapy,strength. This is helping her reach her goal of weight & strength to allow her bone marrow transplant to go forward. My husband & I are her caregivers & this product is a godsend ! Rated 2 out of 5 by Prabhu from Got stomach pain after drinking this drink I bought the 4 bottle case, when I tried for the first time I had stomach pain, this continued each time when I had one bottle of drink. When I had my 4th bottle today at 2:30 PM CST, 2 hours after my lunch and I had the same problem. Rated 5 out of 5 by Rebecca9 from This product has great features. This product tastes good & has the nutritional value I need. Rated 5 out of 5 by Deboran from Great. Product Helps me feel better gives me energy making me able to have more energy and helps my son gain weight my son only has half a stomach and can not eat much food but Ensure he can drink feels better about his self. Rated 5 out of 5 by galu from Yum This product tastes so good, it's hard to believe it's good for me, too! Rated 5 out of 5 by allthroughgrace from grateful for this! I have struggled with my weight over the last 10 years due to medications, No, its not what you would assume, I Cant seem to put weight on or keep it on...or that was the case until I found this! I was able to hit my goal weight of 142 when I add this to my diet. I have been out for nearly a month due to finances and unfortunately I've dropped down to 124...I definitely notice the loss of muscle tone that I was able to maintain when this was part of my diet. I cant wait to get Ensure Enlive back in my diet!